The worst (and it was still quite good) match of the World Cup so far looked to be heading to the first draw of the tournament, only for Haris Serefovic to pop up at the last minute to rescue three points for Switzerland. There was very little to the game however. 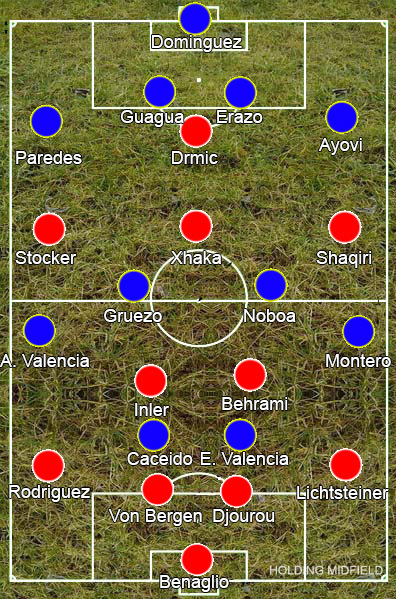 Ottmar Hitzfeld sent out Switzerland in a 4-2-3-1 while Reinaldo Rueda set up Ecuador in a 4-4-2. The Ecuadorians unsettled Switzerland early on by pressing intensely high up the pitch, but once they got the lead from a set-piece they sat back and defended. Switzerland’s answer to this was to get their full-backs driving forward and swinging in crosses throughout the game. Xherdan Shaqiri had a poor game out wide but was moved into the middle to greater success in the second half, his dribbling at the heart of the defence winning some free-kicks. The Swiss had a goal wrongly disallowed from a cross and a second won them the game, but given this was pretty much all they did for 90 minutes it wasn’t a hugely successful strategy and more an ode to persistence.